The RGPS-7084GP-P is a managed redundant ring PoE Ethernet switch with eight 10/100/1000Base-T(X) P.S.E. ports and four 1000Base-X SFP ports. The RGPS-7084GP-P provides advanced IP-based bandwidth management which can control each IP device's maximum bandwidth. The user can configure IP cameras and NVRs to raise or lower the limit the bandwidth of other devices. The RGPS-7084GP-P also features application-based QoS which can set priority levels for data streaming according to TCP/UDP port number. This switch includes advanced DOS/DDOS auto prevention. If there is any IP overflow, the RGPS-7084GP-P will lock the source IP address to prevent the attack. This is a hardware-based prevention so it can prevent numerous DOS/DDOS attacks both immediately and completely. All functions of the RGPS-7084GP-P can be managed and centralized and applied to all Web-based, Telnet, and Console (CLI) operations. 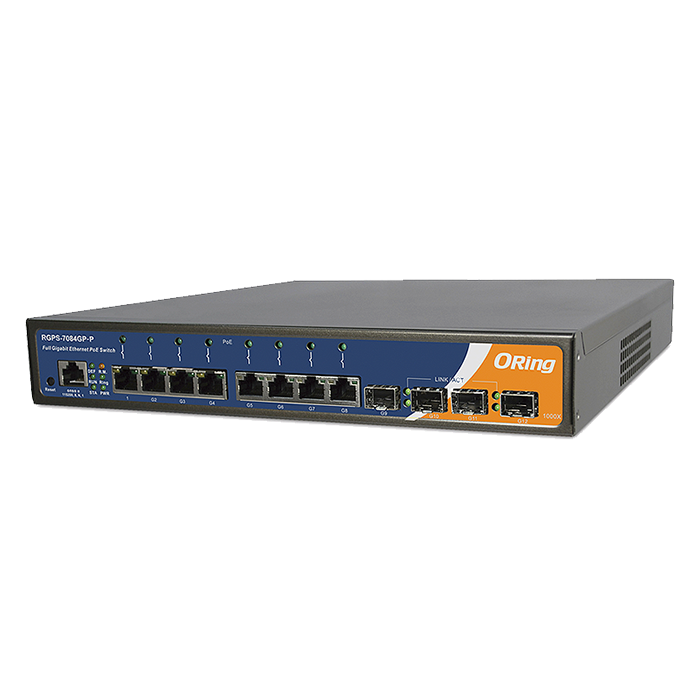 This switch is the perfect choice for highly-managed, Gigabit Fiber Ethernet, and PoE applications. System Ready Indicator (STA) Green : Indicate system ready. Blinking for system is upgrading firmware. O-Ring Indicator (Ring) Green : Indicate system operated in O-Ring mode Blinking to indicate Ring is broken.